Taylor Swift was a true all-American girl at her concert Friday night as she honored the U.S. women’s soccer team by bringing them onstage. Fresh off their World Cup championship, the players joined Swift during "Style" at the MetLife Stadium in East Rutherford, New Jersey. Four of the players are from New Jersey. 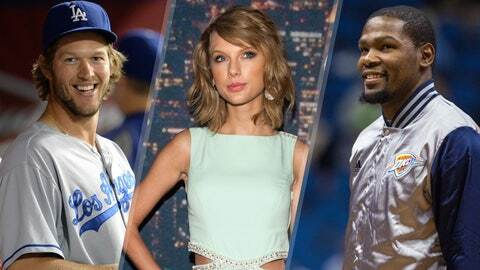 Concertgoers screamed loudly for the players, who waved two American flags and sang along to Swift’s hit song. They also brought their trophy and let the singer hold it. "I wanna hold it one more time," Swift said. They huddled like a team at the end of the performance, and the audience chanted "U.S.A." after they exited. And, by the way, this wasn’t the first time that Swift brought women champions onto the stage. Swift’s girl-power swagger continued when she and her famous friends recreated her popular "Bad Blood" video onstage. Lena Dunham, Hailee Steinfeld, Gigi Hadid and Lily Aldridge — all dressed in character from the song’s action-filled music video — joined the pop star during the beat-driven track. "We’re going to bring the ‘Bad Blood’ video to life," Swift said. And before Swift called out the soccer team during "Style," she introduced model Heidi Klum, who worked the singer’s stage like a runway. But the night wasn’t completely dominated by women. Swift brought R&B pop singer The Weeknd onstage to sing his latest hit, "Can’t Feel My Face." Swift even sang some of the second verse. Swift’s Friday stop on her 1989 World Tour featured songs from her best-selling "1989" album, including "Blank Space," "Welcome to New York" and "Out of the Woods." She closed with the anthemic "Shake It Off." Opening acts included HAIM, Vance Joy and Shawn Mendes. The U.S. women’s soccer team celebrated earlier Friday in New York City with a parade. The U.S. returned to the top of the FIFA women’s rankings after winning the World Cup. The U.S. toppled Germany before beating Japan 5-2 in Sunday’s final in Vancouver to collect the top prize in women’s soccer for the first time in 16 years.